Oh. how we Aussies love our weekend getaways, picnics, barbies and camping holidays. The love of the great outdoors coupled with the love of fine food and icy cold drinks is something that’s inherent in our DNA. So, it’s no wonder many of you are currently considering getting an ice box. Because let’s face it, nothing beats having a nice, cool beer while enjoying the fresh air out in nature or on one of our pristine beaches. In general, all ice boxes for sale are made to resist hot temperatures and whatever gets thrown at them. With so many models to choose from, ice boxes have come a long way since their humble beginnings back in 1840 when they were constructed solely out of wood. Since logically, wood is not a good material when you want to store ice under the hot Australian sun, today we have two types of ice boxes for sale. These ice boxes are constructed from polyethylene plastic that’s further supported by a layer of insulation between the outer coatings. Polyethylene ice boxes are manufactured by using the roto-moulded method, which means the larger parts are formed from one complete piece of polyethylene. Because of this, there are fewer gaps which helps prevent the cold from leaking out and keeps external heat absorption to the minimum. Due to their design, polyethylene ice boxes are considered to be the most energy-efficient choice. As a result, some premium brands like for instance Dometic Waeco can store ice for up to 10 days! All in all, polyethylene ice boxes have many advantages over the fibreglass models with one exception – they will often retain odour. This means they’re not the greatest choice for fishing trips, and you have to remember to clean them thoroughly after each use. The inner and outer layers of these ice boxes are both made of fibreglass with a layer of insulation between them that helps the contents remain cool. The great thing about these ice boxes is that they are non-porous which means they won’t retain any smells or odours which makes them a great choice for storing fresh fish. Though, you need to be extra careful when handling these iceboxes since fibreglass can become easily damaged. Another downside of fibreglass ice boxes is that they tend to weigh a lot, making them a little difficult to move around. But overall, they have great cooling abilities. 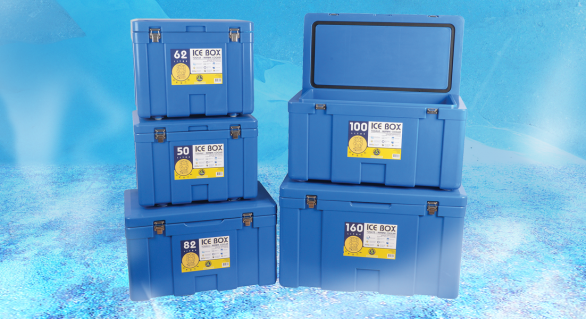 With optimum conditions and under normal outside temperatures, a fibreglass ice box can keep ice for 5 – 7 days.